Common issues you may prevent by selecting the right ENT EHR system. When evaluating ENT EMR software, it’s important to anticipate—and, hopefully, minimize—the types of issues you may encounter day to day. By choosing the right system, you may eliminate many frustrating problems that lead to the most common otolaryngology EMR support requests. Of course, no matter which system you choose, you’ll occasionally run into minor snags or have questions. But with a great system and vendor behind it, you won’t have to contact support very often, and you can have your issues resolved promptly rather than being on hold for hours. So let’s break down the top five otolaryngology EMR support requests and how you can help prevent these issues from interrupting your workday. One extremely common place where otolaryngologists encounter issues with their ENT EHR system is building templates. This process is already very cumbersome and can take days or weeks, so it’s frustrating when a system error deletes one or more of your templates and you have to go back and rebuild them, or call support to see if they can get them back. Additionally, if the software is confusing rather than intuitive, you may have trouble building your template to your specifications, forcing you to call support for more information. A great way to help avoid this is to simply choose a system like EMA™ for Otolaryngology that doesn’t require user-driven templates. EMA comes with thousands of ENT histories, diagnoses, plans and procedures pre-loaded, so it’s ready to use right out of the box. Additionally, it’s updated regularly to keep pace with developments in the field. As a user, you still have the ability to add your own customization. You can modify the built-in encyclopedia or create your own Protocols to instantly document common clinical scenarios. Plus, the system “customizes” itself as you work, remembering your preferences and anticipating your next move. This adaptive learning and comprehensive medical content allow you to have the benefits of customization, while avoiding the hassle of creating templates. Unfortunately, many EHR systems are notorious for being difficult to use, sometimes requiring dozens of clicks to accomplish a simple task. It may appear that the software was designed with the complete absence of any input from a practicing physician. However, even if an EMR vendor champions their system as efficient and easy to use, the reality is that many systems are designed to fit all specialties. So when it comes to the otolaryngology-specific work you do, they may simply not be as efficient. You may have to sift through extra fields and steps that don’t apply to otolaryngology, with no way to permanently hide or skip them. Meanwhile, certain fields that are valuable for otolaryngology may be missing or difficult to access. Hopefully, you can avoid a system like this by watching detailed product demos and asking to speak to references in your specialty before signing any contracts. Unfortunately, it can be difficult to see every single feature of the software in a demo, and there may be some unforeseen issues you encounter once you actually start using it. You can come up with temporary workarounds, but in the end, you may find yourself having to repeatedly submit requests for workflow modifications or additional flexibility. In a company that doesn’t focus on otolaryngology, your request may simply not take priority because they have many other larger specialties to serve, like internal medicine, pediatrics and cardiology. An easy way to avoid this is to choose a system like EMA that was built for otolaryngology from its inception. When a practicing otolaryngologist actually helped program the software and design the workflows, it’s able to efficiently capture specialty-specific data. Another thing to look for is a flexible system that offers more than one way to document, rather than forcing you to follow a predetermined linear path. EMA adapts to remember your unique preferences and workflows, anticipating your next move to help save you time. With a system that’s designed not just for otolaryngology, but also for your unique way of practicing, you should be able to avoid repeatedly contacting customer support to get your EHR to fit your workflow. When your EMR system starts acting slow or is unresponsive or buggy, it can completely disrupt an otherwise smooth and efficient day in the office. It can make matters even worse when you email or call your otolaryngology EMR support team, but can’t get through to a real person. Even more frustrating, they may promise that your urgent issue will be addressed, but you may find it still isn’t resolved hours or days later. Unfortunately, no amount of quality control, testing or infrastructure safeguards can prevent slowness, downtime or bugs 100 percent of the time. But they can do a lot to reduce its occurrence. Moreover, if it does happen, a responsive, well-run support team can work to handle it well and resolve the issue promptly so you can stay focused on your patients. Even when you follow the right steps in creating your clinical note, it can sometimes be hard to translate the encounter into codes and modifiers for billing. For instance, you may have to narrow down specific ENT ICD-10 codes from a long list, add modifiers manually, and hope that the modifiers link correctly to the codes and that you’ve chosen the correct E&M level. Some systems feature rudimentary coding assistance, but when the note is based largely on free text, it can be difficult for the system to know which codes actually relate to the encounter. You may find yourself repeatedly adjusting the coding manually. Or, in other systems, the entire process of entering the billing data may be so convoluted that it warrants contacting customer support. So how can you work to avoid this? Choose an otolaryngology EHR system like EMA that captures primarily structured data and captures billing information based on that structured data. As you tap through the visit, EMA automatically suggests codes and modifiers, then populates them on an encounter form for you to review before finalizing the note. To make the process even easier, EMA includes 3D body diagrams with hundreds of preloaded anatomical locations, so you can pick specific ICD-10 codes just by tapping the image. EMA also keeps track of the various data points required for different E&M levels and demonstrates, in real time, whether you’ve met the requirements for a given level. With help from these advanced structured data tools, many EMA users find that they’re able to capture billing and coding data more easily, without needing to manually adjust as much as they did with other systems. As your MIPS score impacts an increasing percentage of your Medicare revenue, it’s becoming increasingly important to make sure you’re utilizing as much of your applicable data for MIPS reporting as possible. Unfortunately, you may document a visit in your EHR just to realize that it hasn’t captured the right numerator or denominator data. It may take a call to customer support to realize that you actually have to go back in and re-enter that data elsewhere for it to count. The more time and clicks it takes to capture essential MIPS data, the easier it can be for patients to simply fall through the cracks, which can impede your ability to meet certain measures’ requirements. In other cases, you may experience technical difficulties with exporting your MIPS data for final submission on the CMS website. The file may not download to your computer properly, or perhaps you discover that key data is missing. When the deadline is fast approaching, having to contact support and potentially wait a long time for a response can be a source of stress you just don’t need. So what’s the answer? Aside from a responsive support team, look for an ENT EHR system that captures your MIPS data within the flow of the visit and lets you track your progress on a daily basis. This can not only save you time and help make your MIPS management easier, but also it can help you avoid unpleasant surprises at the end of the year. When you submit final data, EMA doesn’t require you to go through the process of exporting your data and then upload it to the CMS website. 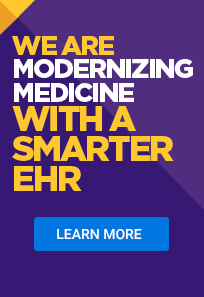 Instead, you can submit your data in just minutes using the Modernizing Medicine® MIPS CQM. Now that you know the top five otolaryngology EMR support requests, you can make an effort to avoid them. If you take care to choose a topnotch, ENT-specific EHR system like EMA, you can help keep your practice running more smoothly by helping reduce the number of issues and interruptions you may encounter. And on the occasion that you do run into an issue, an excellent customer support team can help make sure they get promptly resolved. Outstanding design, reliability and customer service are part of why our EMA EHR system has ranked #1 in otolaryngology for four years by Black Book™ Research. In fact, 92% of our clients across all our specialties are satisfied with our support, and our support team was named Customer Success Team of the Year at the 2017 SIIA Company CODiE Awards and a Customer Service Department of the Year Gold Winner at the 2018 Customer Sales and Service World Awards®. Interested in seeing EMA for yourself? Unfortunately, no amount of quality control, testing or infrastructure safeguards can prevent slowness, downtime or bugs 100% of the time. But they can do a lot to reduce its occurrence. Moreover, if it does happen, a responsive, well-run support team can work to handle it well and resolve the issue promptly so you can stay focused on your patients.